Capital One Arena, formerly the Verizon Center, is a huge 20,000-seat arena in Downtown Washington, D.C. that hosts about 220 events each year, including concerts, family entertainment and athletic games by the NHL's Washington Capitals, the NBA's Washington Wizards, the WNBA's Washington Mystics and the Georgetown Hoyas Men's Basketball Team. Capital One Arena offers modern stadium-style seating and a 14ft x 25ft high-definition scoreboard with over 1,000 feet of linear LED boards. Also on the premises is a Team Store sporting goods store, The Green Turtle Sports Bar & Grille, VIDA Fitness and Bang Spa & Salon, The Clubhouse, a private restaurant overlooking the court called the Acela Club and a 5,000 square foot premium seating space called “The Player’s Club” where people can purchase tickets to a game. Tickets can be purchased by calling (800) 745-3000, visiting the box office or online through Ticketmaster.com. Plan ahead and arrive early. Take a look at the event website and know where your seat is in advance. Seating is arranged differently depending on the type and size of the event. Eat in advance of the event. Food and drink lines can be long and prices are high. There are a variety of good restaurants in the area surrounding the Capital One Arena including Rosa Mexicano, District Chophouse, Fado and many more. There are also plenty of fast casual dining options. See a full list of restaurants near the Verizon Center. The food sold onsite is typical fast food and not so appetizing. Take public transportation to avoid heavy traffic and difficulty finding parking. Capital One Arena is a crowded arena with constant activity. Keep your valuables close to you and hold on to your children. It is easy to get disoriented so make sure you have a prearranged meeting place if you get separated from family or friends. What's Near the Capital One Arena? The Capital One Arena is located in the heart of Washington, D.C. in the Penn Quarter neighborhood. In recent years, this area has become a great destination for shopping, dining, and theater. The National Portrait Gallery and the International Spy Museum are major attractions located within a block of the Capital One Arena. Washington DC's Chinatown is also located around the corner from the arena. Who Owns and Operates Capital One Arena? 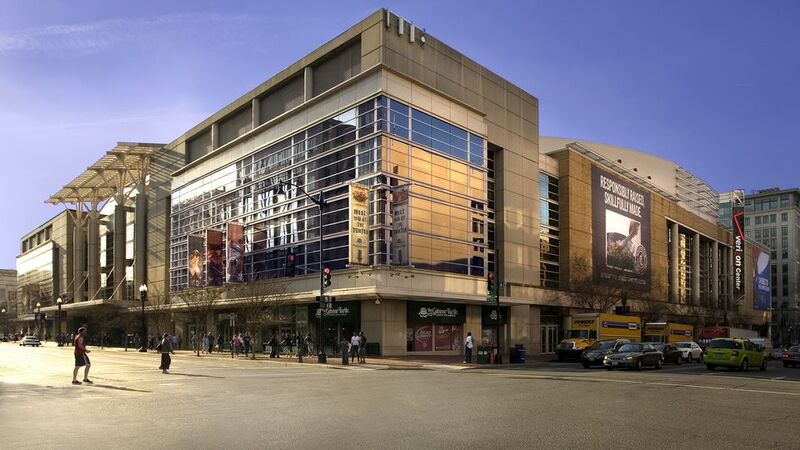 Monumental Sports & Entertainment assumed ownership of the arena, then named the Verizon Center, in 2010, merging Lincoln Holdings LLC and Washington Sports and Entertainment LP into one ownership group. Capital One became the naming rights partner in August 2017. Monumental Sports & Entertainment owns and operates the Washington Wizards, Washington Capitals and Washington Mystics. The group also oversees the management of Kettler Capitals Iceplex, the state-of-the-art training facility for the Capitals (located in Arlington, VA) and George Mason University's Patriot Center (located in Fairfax, VA). Where to Park Near the Capital One Arena in Washington, D.C.